Q: Why is my citrus small, thick skinned with little or hard pulp? A: Joe did some investigating on why his citrus fruit was suffering these issues and found reference that it could be a phosphorus deficiency. Sara found that the fruit was smaller in the areas of the trees that got less sun. Q: Why were my pomegranates hard or rotten? A: The main diseases affecting pomegranate fruit are Alternaria fruit rot (Alternaria alternate), Aspergillus fruit rot (Aspergillus niger) and gray mold (Botrytis cinerea). Another issue leading to cracked fruit is water stress or under watering. For mature trees, deep watering to 3 feet every 10 - 14 days is recommended. Alternaria fruit rot infections most commonly begin in the orchard following rain during flowering and early fruit development. The fungus may grow within the fruit without external symptoms. Infected fruit generally are lighter in weight and slightly off-color such as a paler red and may show some brownish-red discoloration. Aspergillus rot infections begin most commonly in the orchard following rain during flowering and early fruit development. Similar to Alternaria fruit rot, the fungus may grow within the fruit often without external symptoms. However, infected fruit generally are slightly off-color such as a paler red and may show some yellowish to brownish-red discoloration. Good tree management practices, such as dust control and sanitation (removal of old fruit and dead branches), will reduce the incidence of disease. Control insect pests such as filbertworm and leaffooted plant bugs that feed on the fruit, enabling pathogen entry. • After bloom, applications of 11-16 Kg/Ha potassium nitrate may lead to a bigger fruit size and help avoid fruit splitting. Q: Why should I buy fruit trees/vines instead of planting the seeds from the fruit that I bought? A: If you collect seed from a fruit grown on a plant these seeds will produce plants that will be a hybrid of two plants. The new plant will be the same kind of plant, but its fruit and vegetative portions may not look the same as the parent, because the plant is "heterozygous." Therefore, all fruit trees must be vegetatively propagated by either grafting or budding methods. Grafting and budding require that you have a compatible rootstock or mother plant onto which you can attach your desired variety. The reasons for grafting fruit trees and vines are numerous, so I have included a few of most importance. Consistency is also important for the commercial grower, not as much so for the home grower. Precocity: The ability to induce fruitfulness without the need for completing the juvenile phase. Juvenility is the natural state through which a seedling plant must pass before it can become reproductive. In most fruiting trees, juvenility may last between 5 and 9 years, but in some tropical fruits e.g. Mangosteen, juvenility may be prolonged for up to 15 years. Grafting of mature scions onto rootstocks can result in fruiting in as little as two years. Ease of propagation - Because the scion is difficult to propagate vegetatively by other means, such as by cuttings. In this case, cuttings of an easily rooted plant are used to provide a rootstock. In some cases, the scion may be easily propagated, but grafting may still be used because it is commercially the most cost-effective way of raising a particular type of plant. Hardiness - Because the scion has weak roots or the roots of the stock plants have roots tolerant of difficult conditions. e.g. many showy Western Australian plants are sensitive to dieback on heavy soils, common in urban gardens, and are grafted onto hardier eastern Australian relatives. Grevilleas and eucalypts are examples. Disease/pest resistance - In areas where soil-borne pests or pathogens would prevent the successful planting of the desired cultivar, the use of pest/disease tolerant rootstocks allow the production from the cultivar that would be otherwise unsuccessful. A major example is the use of rootstocks in combating Phylloxera. Q: What is dry land or dry farming? A: Basically, dry farming is growing crops without any irrigation to supplement rainfall. This does not mean your tomatoes or other fruiting plants will not be watered, just that you are not irrigating them yourself with drip irrigation or other watering methods. The plants are watered only by rainfall. Of course in extreme drought conditions you will need to water the plants a little to keep them alive. Under normal weather conditions, dry farming is used. Dry farming is a very simple process where you plant and water your fruit plants/tomatoes just as you normally would until the plant begins setting fruit. Once the fruit appears on the plant, you cease to water it. The advantage to dry farming is to create a more flavorful tomato or fruit because the plant will concentrate its sugars into the fruit, and can also help the fruit ripen much quicker. Of course, there are obvious advantages in regards to water conservation, and a reduction in water costs if you are using city supplied water for your plants. Disadvantages of dry farming, is that it increases the chances of blossom end rot for tomatoes due to the fluctuations in watering. This can also cause some cracking or splitting of the tomatoes/fruit if water fluctuations are drastic. Dry farming can also reduce yield sizes, and can promote smaller fruit. Tomato plants may also look straggly and foliage changes could occur. If the plant begins to severely wilt, you may need to irrigate moderately. Dry farming was successfully used for 100's of years by the native American Indians and has gained more recognition recently in the west and southwest due to the continued drought situation. The University of Santa Cruz is conducting a study on the effects of dry farming tomatoes and there are some small scale farmers who are using this technique today in California and the southwest. If you try dry farming tomatoes, be aware that you may need to supplement the rain water. 1. Space water out more after 10 days from transplanting, and ensure that plants are receiving 1 to 3 inches (2.5 cm to 7.6 cm) of rain weekly. If not, give each plant about 2 gallons (about 7.5 litres) per plant "per week", beginning by about the end of the second week after transplanting. Water deeply 2 to 3 times weekly (so, water each plant with about .75 to 1 gallon each time (about 3 to 4 litres), increase water as the plants get larger and when weather is hotter. Q: How much garden area do you have planted? A: About 10 years ago I decided that I would start replacing any nonedible plants in my front and backyard with edible plants. I managed to do this in about 3 years, so today I can say that almost everything we have in our yard is editable either by us or by our desert tortoises and bearded dragon. I am distinct about this as the turtles do require a small area of Bermuda grass and prickly pear cactus as well as they like morning glory and the flowers from the trumpet vine. The bearded dragon also likes the purple flowers from the Texas sage shrub, so we do have 2 of those as well. So, basically my yard had already been designed with planting areas for trees, shrubs and ground covers, so for the conversion I removed all non-edibles from these areas and turned them into edible planting areas, namely for vegetables and vine fruits, but we do have a grapefruit tree, several pomegranates, heat tolerant cherry tree, a new grape vine as well as banana trees. I did expand this a bit by adding some raised bed areas along the east side of the house and along the edge of the front walkway and 2 years ago we put in a display planting bed at the very front of our yard where neighbors could see what could be grown. This does mean that all areas other than the fruit trees and the herb planting areas are changing as needed and it is a lot of work. The good thing is that the neighbors are very supportive and really like seeing what is new in the yarden (as we refer to it now). I also have some things in pots, mostly pepper and eggplant and a few herbs. I am lucky that James can throw nice large ceramic planting pots for me when I need them and as some may know we have our own ceramic studio with kiln. This also allows me to find the best locations for specific plants, which can be a challenge for those of you that may only have a single location for your garden plants. Q: How to control pests in the garden? This came from a reader whose sunflowers were devastated by aphids the previous year and impacted other plants in their garden. A: I have added pest control sections to the planting guide to help with your specific pests. I have also added companion plant information as comments on the main planting guide page first column. As for aphids, there are some companion plants that will deter them (basil, chives, cilantro, garlic, lavender, marigolds, mint, onions, nasturtiums, parsley, petunias, radish, tansy, thyme). You can spray your plant leaves on the underside with mild soapy water or just a spray of water may remove them. There are several good bugs to have in the garden like ladybugs, lacewings and praying mantis. Sometimes I will just simply rub off the aphids with my gloved hands to remove them if needed. We do not do any un-natural pest control, so it is important to attract and maintain the "good bugs" and of course other helpful predators like bats, lizards, geckos and birds. Q: How can I remove pests from my fresh produce? A: I, for as long as I can remember, wash all of my fruits and vegetables in approximate 1:5 solution of distilled white vinegar and water. You can do this right out in the garden before you bring your harvest into the house if needed. I have found this will effectively remove un-wanted pests and will not change the flavor and it can also revive them if slightly wilted. You can reuse the vinegar water in the garden as a touch of vinegar helps lower the pH. Q: When and how often should you harvest/prune cilantro and what is the best method? A: Cilantro is considered a short lived herb, but you can extend its life span with regular harvesting. The rule of thumb is to harvest the top 1/3 of the plant, leaving the bottom 2/3 with some stem leaves (otherwise the plant can not feed itself). I use garden scissors to harvest herbs, but make sure to use clean sharp shears or scissors. You will need to harvest the cilantro about once per week to help stave off bolting. Storing - If you are unable to use all the fresh cilantro you harvested, there are a few ways to store it. To keep fresh for about 1 week, you wash it in at least a 1:10 white vinegar/water, then ensure it is dried completely before storing it in a vegetable bag in the produce drawer of your refrigerator, or I have found that placing herbs in a vase after harvesting and replacing with cool water daily and trimming the stem every couple days, can keep it handy and fresh for a week. Freezing is another method of storage, though I have not had the best results for this method. Collecting the seeds - Once bolting occurs, you will not be able to stop this process and the leaves will loose some flavor. However, the great thing about cilantro is that the seeds it produces are known as coriander spice, which is used in many recipes. Or save the seeds in a cool dry place and you can plant them for your next season of cilantro. Planting the seeds collected - The “seeds” are actually two cilantro seeds encased in a husk. The husk is hard, round and is light brown or grey in color. Gently crush the seed husk holding the two seeds together. Soak the cilantro seeds in water for 24 to 48 hours. Remove from the water and allow to dry before planting. Conditions - Cilantro likes cool/moist soil, so when the soil temperature rises, the plant will react by bolting as this is its survival method to reproduce before the plant dies. So there are a few things that may help extend the cilantro season. 1. Succession planting - plant new seeds every week or two to have new plants ready when the older plants bolt. 2. Plant during cool weather - early spring, late summer and early fall. 4. Mulch - keep the soil/roots as cool as possible. Once the soil temperature reaches 75 degrees, the plant will bolt. Plant in the shade - Cilantro grows fine in shady conditions with indirect or little direct sun. Q: Why are my cantaloupe not sweet? A: Over-watering can dilute the sugar content as the fruit ripens. You can hold back on the watering in last week before harvesting as your melon ripens. You can also reduce the number of melons on a single vine, which may help with the sweetness. Make sure you do not pick it too early. When a cantaloupe is ready to pick, the stem will start cracking slightly where it meets the stem base. It's overripe when it falls off completely. It's also common that you'll start smelling the distinctive musky smell of a ripe melon when you're near the patch. If you can smell cantaloupe, they're ready to pick. Most varieties of cantaloupe will ripen within 4 weeks of appearing on the vine. Q: What should I do with excess fresh Basil? A: It is good to trim back your herbs and when you do that you just need to dry them to have fresh dried herbs. You can dry them in a de-hydrator, but I just dry them naturally either indoors or putting them in the AZ sun for a day in the summer months and 2 - 3 days during the colder months will get them dry. Q: When is the best time to transplant trees and should I remove new lower branches? A: You should always try to transplant trees during their dormant season. Typically this is in the winter months when the trees will not be leaving, flowering or setting fruit. New growth (sucker branches) from the bottom of the truck should be removed if you do not want your tree to become a bush. Q: Why are my oranges splitting? This has not happened before. A: Watering is the main reason for splitting fruit and it can be a bit tricky as over-watering, under-watering or incorrect watering can cause fruit splitting. In this case it was an issue with incorrect watering in that they were not watering the tree deeply enough, but were only watering with a drip/bubbler system for a short time each day. Remember that your citrus trees need long deep watering every 7 - 10 days in the summer and monthly in the winter. It is possible that they had not had any issues previously because the monsoon rains were frequent enough in past years to give the tree the deep watering that was needed, but this year we had very little rain and very light rains during the summer months, which may have caused the issue with fruit splitting that had not happened before this year. Q: How can I control snails in my garden? A: A mucous trail on plant leafs indicates snail and or slug presence in the garden. They will feed at night chewing on the leafs and hide during the day. There are a few natural methods for control. 2. Lay a board or piece of carpet in the garden; Snails and Slugs will gather there during the day. At daybreak, lift the carpet or board and dispose. 3. Plant onions, Rosemary to distract them. 4. Snail and Slugs like beer. Place some beer in a shallow pan (like a pie pan), that is buried in the ground to the rim. In the morning you will find hungover Snails and Slugs that can be discarded. A: Yes, I have successfully grown pumpkins, but I grew a smaller variety as recommended for the phoenix area. I had success growing them in the spring, but un-successful this year in growing them from seed started in July. Even though I kept the new plants shaded from the hot sun in July and August, they gradually died with the higher than normal temps in August. Q: Should I replace my apple tree, that the fruit does not get eaten, with a lime tree? A: If you are not using the fruit that you are growing, then replacing it could be warranted. Remember that limes are very frost sensitive, so you will need to place it in a warm/protected area of your yard (southern exposure best), which is very different than an apple tree that requires frost hours to do well. So, you will need to assess if the location of the apple tree you want to replace is appropriate for the lime tree. There are several varieties: Mexican (Key lime), Tahiti (most frost hardy as it is a hybrid of lemon and lime), Sweet lime (Palestine & Mexican), Kafir lime (used in Thai cooking). The sweet lime is most often used in southwestern cooking. Be sure the tree that you buy identifies the variety and the rootstock on the tag. Also note that fruit is yellow when ripe not green for the sweet lime varieties. Q: When is it time to trim back my pomegranates? A: Once the fruit has been harvested and the leaves have dropped in December/January you should trim back the plant. Q: When should I prune my citrus trees? A: Prune after frost damage has passed, typically late February to early March. April is too late and can allow bark damage from sunburn to occur. Remember that every cut is a wound, so trim as little as possible. Q: Why are all my vegetable plants stunted? A: Stunted plant growth can be a result of a Phosphorus and or Nitrogen deficiency, and can also be caused by salt build-up in your soil. The Nitrogen and Phosphorus deficiency can be addressed with a fish emulsion/seaweed fertilizer (see recipe from my planting guide sheet on organic fertilizers). The salt build-up would be noticeable by a white crust that may form on the surface of your soil. This is a typical problem in the desert and can be compounded by drip irrigation that does not help leach or dilute the salt at the surface of the soil. To leach the salt you can simply water with a hose and gentle sprayer with a good amount of water (2 inches over 2 hrs in the literature). Gypsum and soil Sulphur can also be used to counteract salt build-up by lowering the soil pH. Another way to combat possible nutrient deficiency or ability of your plants to get the soil nutrients, especially if you have some salt build-up, is to treat your soil or plants with Epsom salt. Studies show that magnesium and sulfur, two naturally occurring minerals that are major components of Epsom salt, may help plants grow greener with higher yields and more blooms. Magnesium creates an environment conducive to growth by helping seeds to germinate, increasing chlorophyll production and improving phosphorus and nitrogen uptake. Sulfur is also a key element in plant growth, helping produce vitamins. • Prep your garden by sprinkling 1 cup of Epsom salt over 100 square feet. Mix into the soil before planting. • Take Note! Do not prepare soil where you grow sage. This herb is one of the few plants that doesn't like Epsom salt. Q: Why is my compost not decomposing? A: Slow decomposition can have several causes. The ones most noted are, lack of nitrogen, poor aeration, too dry, pile is too small. Add green material for more nitrogen, turn the pile to get more aeration, add water to get it to a moist condition, and if your pile is just too small add more brown and green to make it at least 1 cubic yard. Invest in a compost thermometer and check it regularly to make sure it is 80 - 150 degrees. The hotter, the more microbial activity equals faster decomposition. Don't let it get over 160 degrees (very difficult to do), as this can then be a fire hazard. Q: I am ready to start a garden, what advice can you give me on getting started? 1. Decide the type of planting area that is best for you and size (typical community garden beds are 2’- 2.5’ W x 6’ or 8’ L), as well as the location. My demonstration garden faces south (all day sun) and is roughly 2.5’ W x 6’ L and I currently have lettuce, cabbage, onions, cilantro, bok choy, brussel sprouts and spinach growing in this raised bed. In my north facing backyard I am growing cauliflower, broccoli, lettuce, and cilantro, which all do well growing in the shade in winter. In summer, most plants will require some shade. I grow my basil on the east side of my house, so it gets morning sun, but afternoon shade. Raised beds are a great option to quickly get your garden started with less physical work. Keep in mind that the width of your raised bed should allow you to reach the center of the bed easily from either side. This is typically no more than 2-3 ft. wide. Ground level gardening will require some digging and removal of the very alkaline/clay soil here in the low desert. You will need to amend/mix the native soil with compost, sand and manure to a depth of 8” to 12” for best results. Again you will need to pay attention to the width to ensure you can reach the plants for caring and harvesting. The other option is containers. I still grow many plants in containers, mainly peppers, eggplant, mint (invasive if grown with other plants), and some cherry tomatoes. You can grow most plants in containers, so for a first time gardener it can be a good option. I have grown onions, ginger and peas in containers before and there are many more vegetables you can grow in pots. 2. Make a list of the fruit or vegetables that you like to eat. It is great to experiment with growing different plants, but you will get the most satisfaction from your edible garden by growing the food that you enjoy and that you would like to share with others. 3. Decide if you will start your plants from seed or purchase small plants. I started out purchasing plants as this is a fast way to get your garden going, but over time and experience realized that a mix of both was most practical. Make sure whether starting by seed or plant that you choose early maturing varieties (on the seed package it will list number of days to mature). Because we have a short spring growing season before temperatures rise, you need plant types that mature faster. Start from seed, plants that only last 1 season (annual) and or have minimal production per plant. For example cilantro is a cool weather herb that is very easy to start from seed, but it is done once the daytime temperatures reach 90 degrees. Additionally, cauliflower are huge plants that only produce 1 head per plant, so if I were to buy a plant for $2 - $4 dollars, then take care of the plant for several months, my investment for that 1 head of cauliflower would be well above the cost of buying a head of cauliflower at the market. Good options for buying a small plant to start, would be chili pepper plants. Peppers can last for several years and produce lots of peppers a couple times a year. So, it is easy to recoup your cost of the plant and care in a short period of time. There are also some herbs that will last many years (perennials) like French thyme or oregano, that are difficult to start from seed, so buying a small plant is a good option and makes fiscal sense. Q: I planted a jacaranda tree that is about 9 feet tall and looks good so far. How long should I wait before removing the wooden stake that it's tied to? It looks really tight and suffocating!! A: Ideally it would be best to not to have to stake your transplanted tree, however reality is that depending on how the nursery has trimmed the tree in their care, it may not have the proper stability when transplanted. If the tree is not stable enough to not blow over or fall over, then some proper staking may be required for a short time. Typically what is provided by the nursery is not the proper staking for the tree once transplanted. So, without a picture of your tree, I will provide you with some questions that will help you assess if the tree needs to be staked. Does your tree have many small branches along the entire length of the trunk? In other words have all of the lower branches been trimmed off to form the classic tree shape? - If you do not have the lower branches that would be normal for an immature tree that help the girth of the tree to become larger, then the tree may not have enough trunk girth to make it stable, the proper staking would be recommended for a short time. 2. Was the tree staked in the pot that you purchased it in? - If it was being held up by a stake when purchased, then it may have prevented the tree from becoming strong enough on its own. Trees/plants need to be able to sway with the wind as this helps the trees wood fibers to become stronger. So, if these couple questions have led you to the answer that your tree may need some proper staking, then here is how you would want to go about doing it, with the intent that it is a short term therapy. Stake Material: At least 2 Posts of wood or metal of sufficient diameter for the tree (at least 2”). Size: The posts should be no taller than the lowest branches of the tree once placed in the ground. Proper height will allow the tree to sway in the wind as needed without the branches hitting into the stakes. Tie Material: You want to minimize contact with the trunk or stem. The best ties are soft but durable nylon straps. Wire inserted into a section of garden hose is acceptable. Never use bare wire. The tree should be allowed to move in the wind, so care should be taken to ensure the ties do not bind tightly or rub the trunk, causing a wound. Remember that just inside the bark layer is the cambium layer and this is critical to the nutrient flow for your tree, any damage to this layer may impact the health of your tree. Stake position: If using 2 stakes, then place them inline perpendicular to the prevailing wind direction (typically southwest in the valley, but you can have a different flow based on your neighborhood). For example if your tree is exposed to winds blowing west to east, place 1 stake north and 1 stake south of your tree. The stakes should be positioned beyond the root ball of the tree to avoid any root damage. Sink them deeply enough so they do not move. Make sure they are no higher than the lowest branches of the tree. 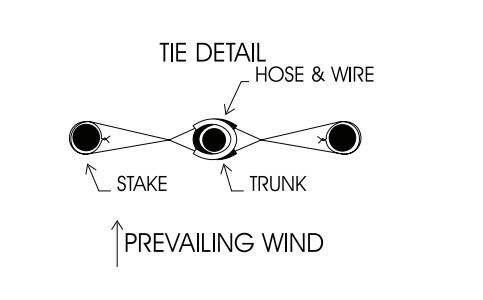 Tie position: Place the ties at six inches above the lowest point on the trunk where using your hands as the ties, the tree is standing upright. Inspection Monthly: Most important is to inspect the staking monthly. Are the stakes in good shape and still providing support? Have the ties done any visible damage to the trunk? You should untie them periodically and reposition them according to the tie position instructions. As the trunk builds strength, the tie attachment point should move lower down the tree. Eventually, you will untie your stakes and your tree will remain upright. This is the point to remove the stakes. Q: Why are my squash not setting fruit and when they do the fruit turns yellow and dies? A: Young squash plants will first produce only male flowers, so you will not get any viable fruit until the plant is also producing the female flowers that can be cross-pollinated to produce the fruit. Squash is a type of plant that requires pollination from male to female flower. Many of our helpful European honey bees have been annihilated by people trying to protect themselves from Africanized honey bees. In addition, many bees have been killed by mites. As a result they are not available to assist with pollination. Squash, melons, cucumbers and other vegetables that have separate male and female flowers will benefit from hand pollination. Early in the morning use a cotton swab to take pollen from the male flower and place it in the female flower. Q: How can I manage the aphids in my garden? A: The best way to control the bad bugs (those that feed on plants) is by having enough good bugs (those that eat other bugs), and natural predators like gecko's, lizards and toads in the garden. This is not always a simple task, but you can buy praying mantis egg pouches and lady bugs from local nurseries. You need to get them at the beginning of the spring season and if possible it is best to get lady bug larvae (before they have wings), as they can not just fly away to another yard. In order to be able to keep them in your garden, they need to have an ample food supply and the right habitat. If you are spraying the outside of your home and yard with pesticides, then the predators will not have the food supply needed and will travel to the yard that does. Simply spraying with water or soapy water is not always a very effective remedy for aphids, especially if not caught early. So, in my excel planting guide take a look at the insect control recipe's sheet for other natural sprays that can be used to manage aphids, but keep in mind that you may also kill good bugs with any of these methods. Some beneficial bugs that can help out in the garden are: praying mantis, lady beetles, assassin bugs, green lacewings, parasitic wasps. Keep ants under control and away from the honeydew that is secreted as a result of aphid feeding, as they will protect their food source and ward off the predators. Q: How often and when should I fertilize my fruit trees? A: Starting with the second growing season after planting, deciduous fruit trees should be fertilized with a nitrogen fertilizer each spring. Citrus should be fertilized with a nitrogen fertilizer 3 times per year (January or February, April or March, and May or June), after it has been in the ground for 2 years. Correct fruit tree fertilization will ensure healthy foliage, promote vigor, and maximize fruit quality. See publications for more information on fertilizer selection and application rate. Q: Why did my garden plants not thrive, plants were stunted, slow growth, not setting fruit? ○ Growing the same family of plant in the same location (no plant rotation), faster depletion of certain nutrients. Phosphorus (P) - essential for photosynthesis, encourages blooming, root and cell wall development. Potassium (K) - promotes disease resistance, root and cell wall structure development. Calcium (Ca) - Cell division, building plant proteins, flowering, fruiting. Make sure you have adequate Nitrogen, Phosphorus and Potassium in the soil before planting and additional application of a synthetic or organic fertilizer may be required during the growing season. Organic fertilizers will have lower concentrations, but are slow to release and thus pose little threat to the plant, but may require more frequent application. Whereas synthetic fertilizers can have 10 times the concentration, these can burn the plant roots if not applied properly. Q: Why did my melon vines not produce any fruit? A: If you have squash, cucumber and melon plants that are growing and thriving, but not setting any fruit, it could be a lack of pollinators causing the problem. See more about attracting pollinators in the Best Advice section. Then plan your garden accordingly to place the plants that require pollination in the best area of your yard or garden. If you are unable to get a good supply of pollinators you can do hand pollination by using a paintbrush and acting like a bee going from male flower to collect the pollen and transferring it to the female flower. Or refer to the hand pollinating publication below for an alternate method.